The mother remains constant until the deadline on the side of your puppies. With us you get to know the parents, and can convince yourself happy when visiting them as the pups grow up. Our dogs grow up in a private and family atmosphere. There are no big kennels, but a lot of places in our living room. 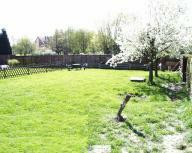 Our dogs can run and play in our big garden area placed behind our house in a village near Düsseldorf. The mother of our puppies always stays together with them until they leave our home and finally go to their new owner.